Stop in 2 or more scatters in view and you’ll win a single Rift spin. During this spin any wild that doesn’t appear on a winning pay-line will become a sticky wild and between 1 and 3 additional sticky wilds will appear on the reels for the duration of this exciting spin. These spins take place on a second set of reels. During your free spins any wild that does not feature in a winning line will stick in place on the grid until it features in a winning pay-line. Every additional Rift symbol you hit activates 1 step on the Rift seal until it is completely filled. Each time you fill up 3 places on the Rift seal you will be awarded 2 additional free spins and 1 additional sticky wild to every remaining spin of the bonus, up to a maximum of 6 more free spins and 3 sticky wilds. This website is operated by Lottoland. Lottoland passes on Customer’s Bets to EU Lotto Ltd, which acts as a bookmaker. EU Lotto Ltd (company number 109514 and registered address Suite A, Ocean Village Promenade, Ocean Village, Gibraltar GX11 1AA) is licensed and regulated by the Gambling Commission for customers in Great Britain (Licence: 000-038991-R-319408-005). When placing Bets, Lottoland acts in the name and on behalf of the Customer. 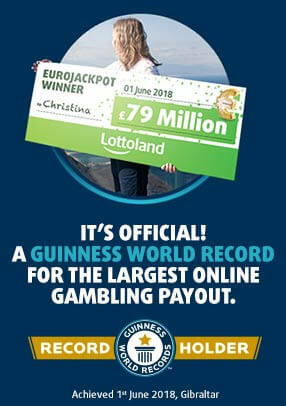 Lottoland is not an official lottery operator and does not buy any lottery tickets on behalf of the Customer. Instead, Lottoland allows Customers to make bets on different lotteries and if a Customer wins a bet, then they will be paid directly by Lottoland and not an official lottery operator. All jackpots are estimates and subject to currency fluctuations. *Tier 1 winning bets on the US Powerball and US MegaMillions are paid out as 30 year annuity or discounted lump sum at Lottoland’s election, and Tiers 1 – 3 are also subject to 38% reduction as per T&Cs . Tiers 1 - 3 for winning bets on SuperEnalotto are subject to 12% reduction as per T&Cs. Lottoland is committed to supporting Responsible Gambling. Underage gambling is an offence. Over £850m prize pay out – serious wedge! To set a deposit limit, click here.To cancel the deposit limit, click cancel. Are you sure you want to remove this promotion?